Working together throughout the year, the NSPE network helped champion the PE cause, advance the careers of PEs and those on the path to licensure, unite a diverse profession, and promote the outstanding contributions of professional engineers. Learn more. Being a licensed professional engineer means more than just holding a certificate and possessing technical competence. It is a commitment to hold the public health, safety, and welfare above all other considerations. NSPE’s more than 80-year history has focused on this core principle, which professional engineers in all disciplines and practice areas hold in common. Learn more about NSPE's Statement of Principles. 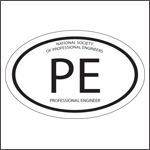 NSPE was established in 1934 to realize a simple but vital goal: create an inclusive, nontechnical organization dedicated to the interests of licensed professional engineers, regardless of practice area, that would protect engineers (and the public) from unqualified practitioners, build public recognition for the profession, and stand against unethical practices and inadequate compensation. Much has changed since then, but NSPE’s fundamental commitment to this vision, articulated at its founding, remains unchanged. The NSPE Strategic Plan is developed by the NSPE Board of Directors in collaboration with NSPE’s representative House of Delegates. It is not a static document. Rather, it is a commitment to ongoing, open and transparent strategic planning and execution. successfully carry out its mission. NSPE recognizes the imperative for change created by the reality in which it operates today, as outlined in Race for Relevance by Harrison Coerver and Mary Byers. In late 2011, NSPE engaged its membership in an open process to define its challenges and opportunities within the context of the “five radical changes” outlined in Race for Relevance. This work was pursued through the activities of seven task forces, involving over 96 NSPE members from 41 states, and over 3,000 hours of volunteer time on conference calls and doing research over the course of more than two years. Informed by these efforts, NSPE committed to making the changes outlined in Race for Relevance and incorporating Race for Relevance concepts and approaches into the fabric of its ongoing governance and operations. Find out more about NSPE’s Race for Relevance and the history of this initiative.